This past weekend marked the opening of a new lane for cyclists downtown on Penn Avenue between Sixth and 16th Streets, making it the third bicycle-only lane in Pittsburgh. It's also the third headache according to some Pittsburgh drivers. A summertime project driven by a call for a more cyclist-friendly city, the Penn Avenue lane promises to protect cyclists and lighten the commute into downtown, but comes at the expense of rerouting outbound traffic and narrowing driving lanes. New bike lanes in Greenfield on Saline Street between Greenfield Avenue and Swinburne Street, and from Schenley Plaza to Anderson Playground in Schenley Park made similar improvements, but at the expense of parking in both areas. While some commuters said the new Penn Avenue lane is a way to "improve safety for drivers and cyclists," other drivers expressed some confusion and aggravation during rush hour last week. One driver said she didn't see any "warning signs to know [the inbound-only change to Penn Avenue] was happening," making for a "chaotic" commute, rather than a safe one. According to the Pittsburgh Public Safety Department, several drivers were cited for attempting to turn into the bike lane, as others proceeded to drive the wrong way on the rerouted road. Though no accidents occurred, the frustration and lack of attentiveness to new signage could have resulted in someone getting hurt. No matter where you're located, take the time to familiarize yourself with the dos and don'ts of bike safety. Know the facts and take the proper safety measures so you can be educated as a cyclist, or as a driver. Even with improvements that allow everyone to share the road, accidents can still happen. 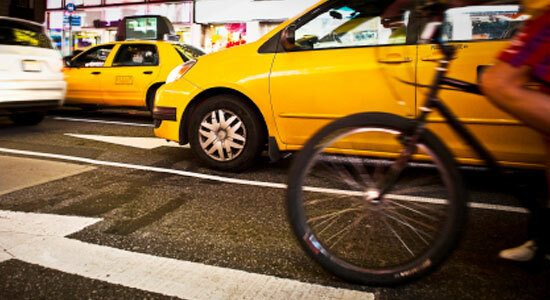 If you or someone you know sustained injuries in a bicycle accident, you may have a case. Contact us at 1-866-943-3427 for a free legal consultation. Our legal professionals will answer your questions at no cost and determine if you have a case. There's no obligation to use our services, so give us a call today. “Bike lanes go live in Pittsburgh.” Pittsburgh Post-Gazette. Sept. 6, 2014. “New Downtown Bike Lanes Case Confusion for Drivers.” CBS Pittsburgh. Sept. 4, 2014.